Tips4PC.com: What Is A Computer Network? Defining a computer network to a computer networking basics class seems an easy job—until you try to do it. The problem is that the definition of a computer network—two or more computers connected to each other—doesn’t account for all of the nuances of real-life networks. Basic computer networking terms seem to get blurred as the years go by. The most basic computer network includes just two computers connected by one wire. (Usually the wire you see is a collection of several smaller wires that function as a unit.) 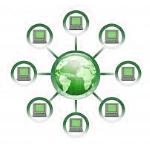 In computer networking basics, we call this a two-host configuration; networks with three or more hosts we call multi-host configurations. 1. The Application Layer is the programs that generate and use network traffic. Think of your Web browser, email program, or Dropbox online drive. It’s the most easy to understand of the computer networking basics layers because you see it working everyday. 2. The Transport Layer is part of Windows that turns the data from the application layer into traffic which another computer can understand and, optionally, keeps track of which packets the other computer has received so it can resend any that were missed.The network layer is similar to postal carrier who picks up and delivers mail to your house. A good postal carrier checks outgoing email for an address and a stamp, while making sure incoming mail gets delivered to the correct address (returning any mail that can’t be delivered). 3. The Network Layer is another part of Windows that figures out where data needs to be sent. In the case of the two-host configuration used here for computer networking basics, the data is usually all sent to the other computer.The transport layer is similar to the machines or people at the post office that sort outgoing mail by zip code and incoming mail into specific mail routes. 4. The Link Layer is the network card in your computer. These days the link layer could be a wireless card, a wired ethernet card, or a telephone modem. The link layer turns the transmissions of the network layer into electricity that is sent over the actual wires.The link layer is similar to the truck that transports your mail. The truck is oblivious to what’s inside of it—it just carries it from one point (one end of the wire) to another point (the other end of the wire).